The Zen Parrot: Of Parrots, Politics, and Coffee: Do Parrots Dream? We were jolted awake this morning at about 5:30 am with the sound of a humongous thump, followed by the furious flapping of wings. Just getting light enough to see, we scrambled out of bed to check all the parrot cages to see which parrot fell off its perch. We found our female Blue and Gold macaw Miss Bubba Boy clinging to the side of her cage, quite agitated and somewhat disoriented. We suspect that a bad dream caused her to fall off of her perch. Which got us thinking while we were trying to fall back to sleep (just who wants to get up at 5:30 am on a Sunday, really!). Do parrots dream? It is pretty well established that parrots are capable of cognitive reasoning. Parrots can carry out actions purposefully, and they are capable of quite sophisticated problem solving. So it would not be any surprise to us that parrots dream and even suffer nightmares. Our Greenwing macaw and Diva parrot Roxanne, named for the song. as well as our female Congo African grey parrot Arua, have fallen off their perches during the night on multiple occasions. Our female Congo African grey parrot Arua, just hanging out! 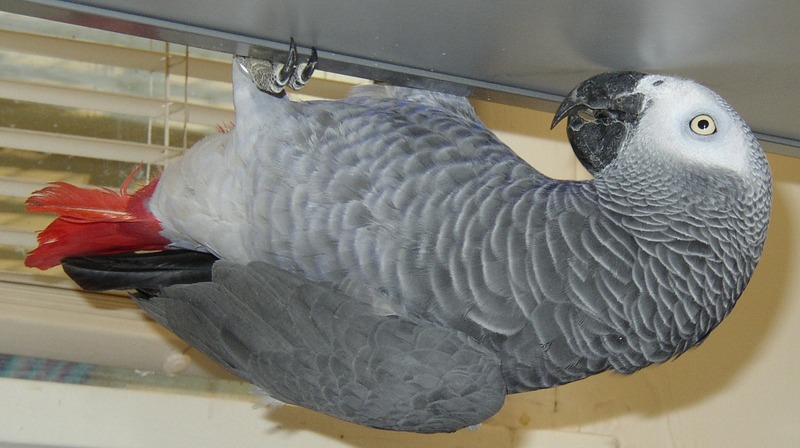 We wonder if birds with greater brain power such as African greys are more prone to dreaming than other birds? We have thought that possibly the parrots were startled during the night by some sound coming from outside the house which may have caused them to fall of their perches. But in at least two cases we can recall, we were wide awake in the night when the falling episode occurred, so we can rule out external causes. Other times we'll be lying awake in the dark of night and hear one of the parrots start to vocalize. Our male Blue and Gold macaw Aboo will softly start speaking to himself, in a voice barely audible. 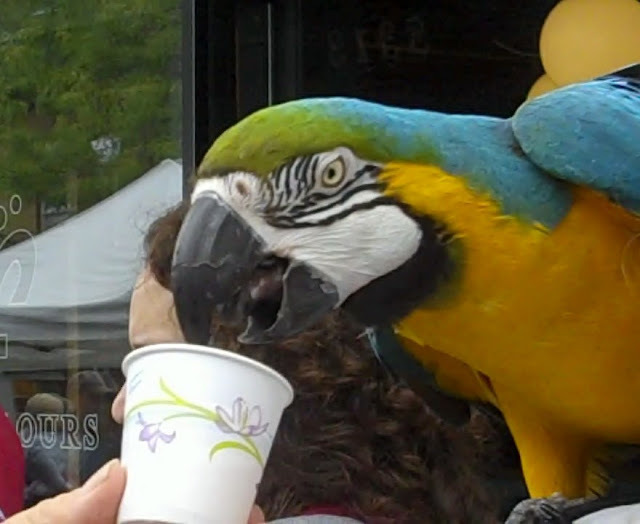 Our male Blue and Gold macaw Aboo playing with our Hyacinth macaw Princess Tara. Is he talking in his sleep. 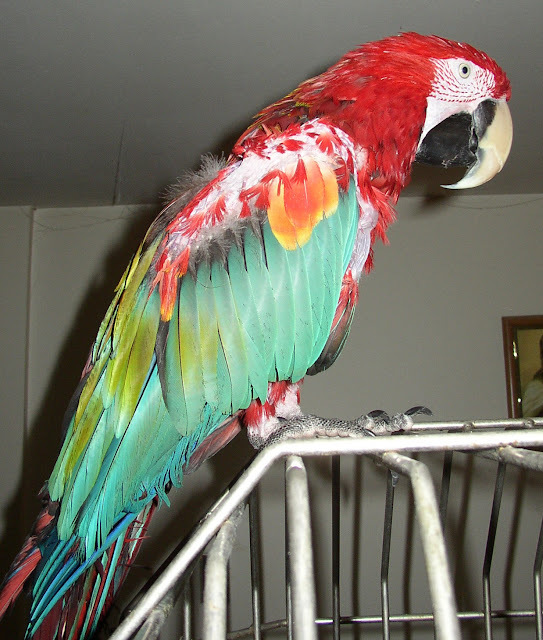 We'll hear our foster Ruby macaw Mr. Cracker laughing out loud in the middle of the night. Is he reliving a prior event in his dreams. Old enough to be a possibly wild-caught macaw, we wonder if he's dreaming of his life before? Mr. Cracker will also on occasion start up a conversation with himself. Our foster Ruby macaw Mr. Cracker is old enough to be a wild-caught macaw. 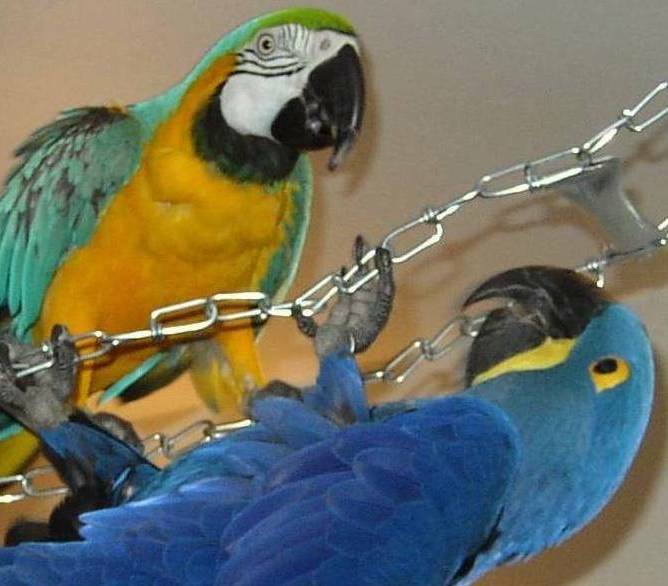 And then there was the night we were awakened by our female Blue and Gold macaw Miss Bubba Boy laughing maniacally in the dead of night as if she were an ax murderer ready to commit a crime. Needless to say, we didn't get out of bed! So, what do you think? Do parrots dream? We think so. And unfortunately experience nightmares as well. If you have any experiences with your parrots dreaming, please share them with us. We're Having a Contest. Our First Ever!